I have discussed previously strategies that enable on-resin chemistry via orthogonal protecting groups. These groups can be removed under mildly acidic, metal catalyzed, or even oxidizing conditions. In today’s post, I’ll demonstrate the utility of using disulfide shuffling as a cysteine protection strategy. Orthogonal cysteine protection strategies cover a wide range of chemical functionality, making it one of the most widely functionalized amino acid building blocks. Lately I’ve been working with disulfide rich peptides and needed the expanded capability to form three disulfide bonds while the peptide is still anchored to the resin. While I’ve already worked out conditions using both Mmt and Acm protection schemes, I’ve needed to optimize conditions for third strategy. I originally considered using Fmoc-Cys(StBu)-OH as the building block. Reducing conditions are sufficiently orthogonal to the above two mentioned strategies, and has been a long-time member of the cysteine protection family. But after some reading of the literature, I found that t-Buthio can be somewhat difficult to remove – often requiring significant reaction times to ensure full removal. Ultimately, I plan to automate this reaction so long reaction times requiring frequent monitoring isn’t really going to suit my needs. Recently though Fmoc-Cys(STmp)-OH, Figure 1, has become commercially available with reports of fast, and complete removal. The STmp group can be readily removed with simply a 5% DTT solution made slightly basic with 0.1N NMM in DMF. Sounds easy enough (and thankfully not too smelly). Despite searching through multiple sources though, I was never able to identify a resin to liquid ratio for optimal conditions. Figure 1. 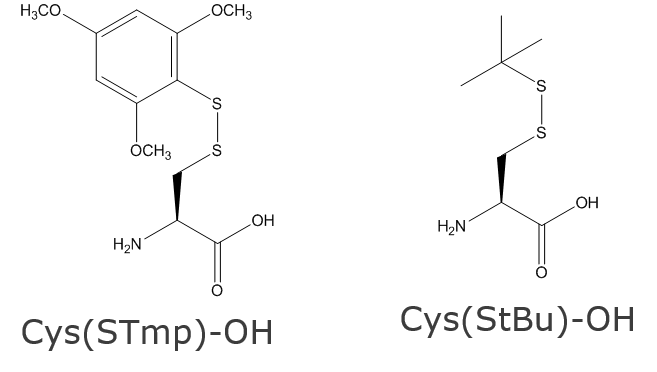 Structure of Cysteine building blocks Cys(STmp)-OH (left) and Cys(StBu)-OH (right) susceptible to side chain deprotection using reducing conditions. So after purchasing the amino acid I decided to synthesize oxytocin, a good model peptide containing one disulfide bond I have been using frequently in this sort of optimization chemistry. I used my Biotage® Initiator+ Alstra to synthesize the linear sequence using standard DIC/Oxyma coupling conditions but only 3 equivalents of the Fmoc-Cys(Stmp)-OH building block (it’s pretty expensive). The linear synthesis worked great (as expected as this point), so I went to work vary reaction volumes to fully elucidate a set of conditions that will be effective for future, larger scale syntheses, Table 1. As with the Mmt optimization, I followed up the STmp removal with an alkylation reaction with the goal to identify peptides that had been successfully deprotected using the reducing conditions and not the highly acidic conditions of global cleavage and side chain deprotection. Disulfide bonds are historically unstable under highly acidic solutions, so it isn’t too far of a stretch to think any remaining protecting groups could also be removed by resin cleavage, complicating the final analysis. I still haven’t fully optimized the alkylation – maybe that’ll be work for a future post – and again I observed crude peptide solutions that contain both doubly alkylated and singly alkylated in addition to the fully deprotected, non-alkylated species, Figure 2. Figure 2. 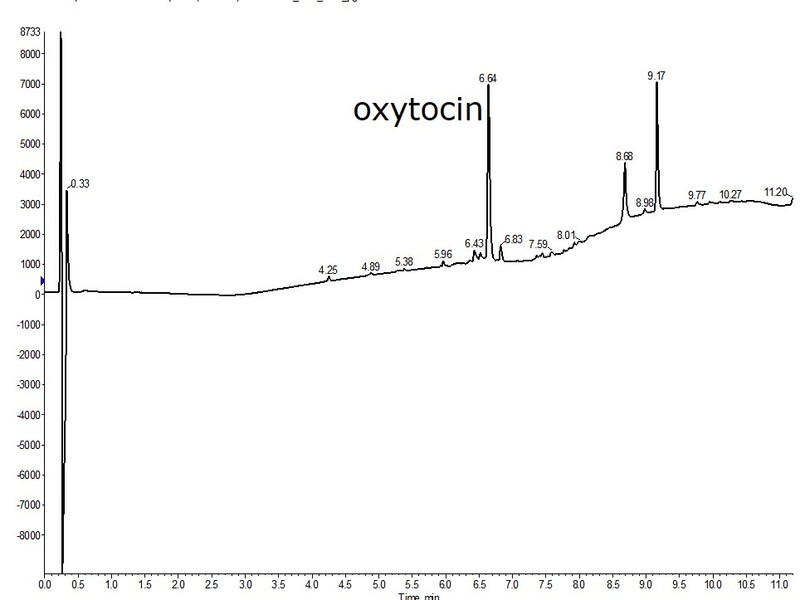 Representative Total Ion Chromatogram of crude oxytocin subjected to STmp removal followed by alkylation with iodoacetamide. The STmp removal conditions differ by total volume, either 4.5 mL (black) or 0.25 mL (red) was added to about 50 mg of peptidyl resin. Generally, all the conditions evaluated gave a high percentage of deprotected peptide as desired, but the alkylation data still leaves drawing an accurate conclusion difficult. So to fully validate the utility of Experiment 1, particularly for use in larger scale syntheses, I decided to repeat the synthesis and fully automate both the synthesis and disulfide bond chemistry. For the on-resin disulfide bond formation, I used about 50 mg of peptidyl resin with 3 mL of the DTT solution, about in 3 reactions each, for 5 minutes at room temperature then followed with Cys oxidation using N-chlorosuccinimide, Figure 3. Figure 3. 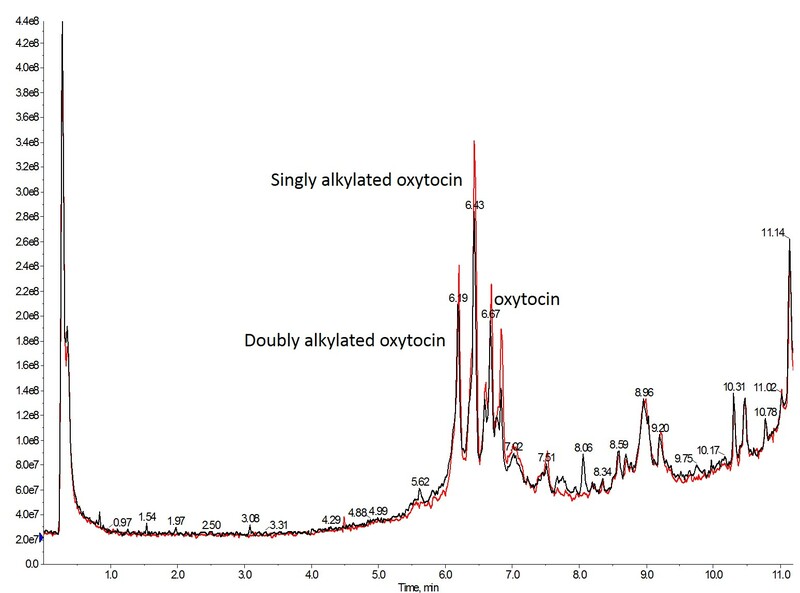 Crude analytical chromatography of oxytocin synthesized and cyclized automatically using optimized STmp deprotection and NCS oxidation chemistries. The peptide was synthesized with 83% crude purity and no linear peptide detected. As you can see the synthesis and on-resin chemistry worked beautifully! I’ll definitely be taking these conditions forward for future, more complex disulfide rich peptide chemistries. Next Next post: How to purify synthetic peptides: what are the options?